Sign up for Broadjam today to follow Mario Racadio, and be notified when they upload new stuff or update their news! 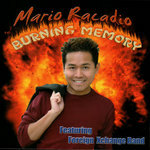 Mario Racadio's first hit single "Burning Memory" CD Single in four different versions.Pop/Rock,Intrumental,Acapella,Dance Version(d' Ablaing Mic).His Dance Version received an award for Garageband.com for "Best Male Vocalist" in Dance Category,Best Dance Track,Best Keyboards and Best Chill Out Song and Next Big Hit Best of 2005 Winner. About a guy leaving her girlfriend and looking for a better life after a while the girlfriend got lonely and she became unfaithful to him.The Girlfriend found someone else.